Jimmie Johnson was set to transfer into the Round of 12. In the final chicane, he wheel hopped and spun. He took Truex with him as Blaney took the win. Johnson re-fired. Do to cutting the chicane he had to come to a complete stop. He did, he then crossed the line in the 8th position. If Johnson didn’t stop, he would have been handed a penalty. Chad Knaus informed Johnson of that over the radio as Johnson was correcting the spin. That spin put Johnson, Almirola and Larson in a 3-way tie for the final two transfer positions into round two of the NASCAR playoffs. Every position and every point matters. Larson was involved in the crash with Keselowski on the restart prior. Larson went to the pit. The crew exhausted the damage vehicle clock. It was bandaged the best they could. 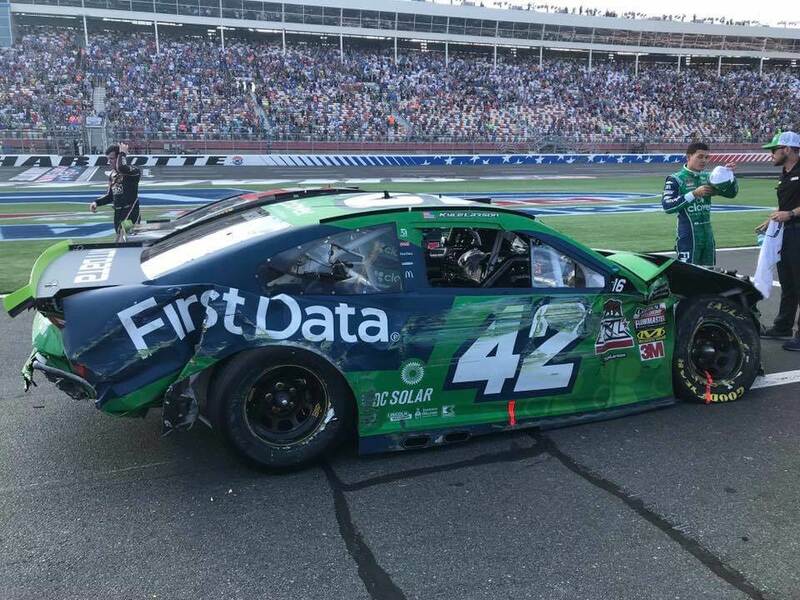 But, the thing was still broken and Larson was well under minimum speed. However, drivers get a few attempts to make minimum speed before they get the black flag from the stand. When the green dropped, there was exactly three laps to go. That’s crucial to how this played out. So, as just as Larson crossed the finish line he had exhausted all three attempts to make minimum speed. Teams get three laps to make minimum speed at all NASCAR tracks. That wasn’t a unique case for the Roval. “If this race would have been one more lap, he probably would have had a timed penalty,” NASCAR Executive Vice President and Chief Racing Development Officer, Steve O’Donnell explained after the race. Larson was asking the crew why he was still on the track. The Chip Ganassi Racing #42 team encouraged him to remain on the track. But, the car still wouldn’t turn. So, in pure video game style, he began bouncing off the walls and forcing it to turn. Coming off the final corner, Jefferey Earnhardt sat parked with a stalled race car. That was a very important position for Larson. If he didn’t make that pass, Larson does not advance into round two. Instead, by Larson remaining on the track with a car well under minimum speed, Jimmie Johnson lost the tie-breaker. Almirola and Larson both had better finishes in the first two races of round one. The 7-time champion will not advance to the Round of 12. “You want to get it right. So, it takes a little longer than we’d probably like,” NASCAR’s Steve O’Donnell explained after the race. Would NASCAR change the rule or it is still how they’d like it given how it worked out on Sunday?